He`s a great guy. I used to see him a few times, he even crashed here for a weekend. I didn`t know that he had diarea, and because it was saturday, we ate a lot of candy. I don`t own a dog, but now I know: there`s a reason why they separate human and dogfood. 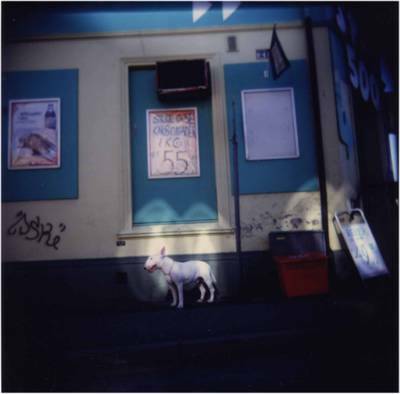 Photographed with a Holga plastic camera. Hey, Charlie! THANK YOU for your comment! I never thought my blog would be seen the first day...I`m so happy to be able to show my photographs to other people. Please drop by some other time. I checked your site, and it was awesome. Great photos. Quirky! The spot light on the dog worked out perfectly in this shot. Very cool!